We had a wonderful stay at the River Otter! The home is very welcoming and clean. The bed in the bedroom is very comfortable! Even the fold out couch was surprising comfortable to sleep on! The kitchen is well equipped as well and we found it easy to prepare meals while staying here. The yard was great for our dog. The house is in a great location that is walking distance to the river and parks for the dog. We will definitely be back. Ive stayed in this home multiple times and I cant believe Ive never written a review. Ive stayed here in the summer, doors open, breeze coming through. All the flowers in the front & back yard, so nice to relax. This wonderful home is in walking (or biking) distance to the beautiful park along the river, to cute downtown with all its restaurants & bars. Great location. And in the winter, it is right off the main highway to go skiing! I love the open floorplan. Ive stayed here with a gaggle of my lady friends. Ive stayed here with couple friends & their children. Ive stayed here with just my hubby & I. It works for all types of groups. The kitchen & dining area & living area are all in one great room, so everyone can hang out and talk. Otherwise, there are a couple of cozy nooks & crannies for reading a book or watching a film. Would highly recommend this house for all types of groups and in all seasons. Cant wait to come back! Cute & Cozy house w/ great proximity to both Downtown and Old Mill (10ish minute walk to both). Great large shower and nice outdoor area. Fabulous place! Absolutely adorable! Had everything we needed. We could walk to shopping/eating out. Excellent communication. Had a great stay at the River Otter cottage. Perfectly located to explore all that downtown Bent has to offer, shopping, breweries and incredible walks by the River. We had our 2 dogs with us, I sometime think that they had an even better time than us! We will definitely be back! The neighborhood has a very relaxed feel. Excellent location! The linens were very soft and we all slept well. The river otter was exactly what we were looking for. Fully stocked kitchen, neighborhood was absolutely perfect, we didnt have a need to contact the hosts but they seem approachable and easy to get ahold of. 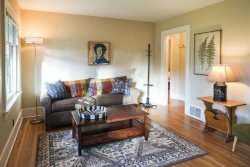 This small and fully equipped rental is ideally located in a quiet neighborhood within walking distance to bike paths, downtown and the river. The bed was very comfortable and we were pleased to find bikes that worked and floating tubes in the shed! The rental was spotless and Bluebird Day co. was responsive and flexible when we had to change our dates. Host was fantastic, neighborhood was very nice...we enjoyed our stay! Sweet, comfortable and cozy house in a fantastic location. We loved being just steps from the river and a short walk to both downtown and the old mill district. This was such a great place to stay in Bend! It worked out perfect for our family of four. So close to the river, Drake Park, downtown, and The Old Mill district. The bungalow had everything...it was so nice to have a washer and dryer! We look forward to visiting Bend again and we will definitely look at staying here again! We loved staying here. The location was perfect for getting around town by foot. The back yard was great for our dog. Wed happily stay again. Perfect location and awesome amenities. The bikes they provided were really great for both a day ride along the river and biking to dinner in town. We loved being able to walk to the river and breweries. We had a wonderful stay at the River Otter! The location was perfect. We could easily walk into Old Mill, Drake Park, downtown Bend, to multiple parks and restaurants. It was easier to get around than expected. The home was very comfortable; it had everything we needed for the weekend. It was the perfect spot for a long weekend in Bend with our dogs! Almost didnt want to write a review because we always want this home available when we come to Bend! Haha! Beautiful home, fabulous location, wonderful amenities. Couldnt have been a better stay. Thank you bluebirds!!! My husband and I and our two dogs recently visited bend for a short work trip (for me) and a getaway for everyone else. We really enjoyed everything about our stay at the river otter, but specifically all of the little touches. Its very well maintained and clean, not to mention really cute. They didnt scrimp on the extras, from the all natural dish soap to the high end toiletries in the bathroom to the locally roasted coffee. Oh and dont forget the mattress, its memory foam and incredibly comfy. We were able to walk almost anywhere we wanted to go, including a handful of great breweries, boneyard being our favorite. Would definitely stay here again! Our stay at the River Otter was cozy, clean and comfortable. The house is tucked away in between the Old Mill District and Downtown Bend. Perfect walking distance to lots of great options for food and fun, as well as getting out with our dog on the Deschutes River Trail. The bed is very comfortable. The bathroom has a nice shower. Albeit it compact, the house has everything a couple and dog could need for a three day getaway. Strong wifi at the home made staying connected easy. The Back Porch Coffee Roasters coffee was a nice amenity. Great communication with the host - easy to check-in and check-out. My boyfriend and I took a roadtrip with our doggie, Philip, from the SF Bay Area up to Southern Oregon and over to Bend. We stayed in this adorable cottage for 2 nights at the end of our trip and couldnt have been more satisfied. Its part of a duplex at the end of a quiet residential street. Such a cozy, cute place....trendy decor, every amenity you can possibly need...there was shampoo, conditioner, lotion, bath soap, kleenex, coffee, creamers, washer & dryer & laundry detergent....the list goes on & on. There was a great notebook with tons of details on area activities and restaurants. We were so tired one evening, we didnt feel like going out & ordered some Thai delivery...was there within 10 mins!! Very comfy bed, nice towels, very toasty wall heaters, cute little backyard (although our doggie was really the only one who had much chance to enjoy it)...if were ever back in the Bend area, this is where well call home. Perfection! My wife and I visited Ben in October and the house was perfect for the both of us. Location is great within walking distance from ten barrels and crux and boneyard breweries. I would recommend this place to any couple looking to visit Bend.